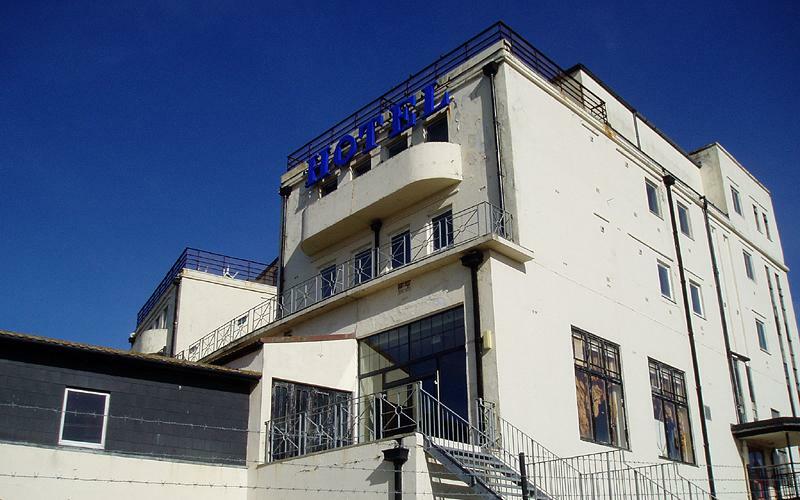 Planning permission was granted during the summer for the conversion of Saltdean’s derelict Ocean Hotel into flats. The exterior may be in a mess at present but don’t let its looks deceive you for this is a Modern building of great significance. For centuries, Saltdean was just a few isolated buildings on a large area of downland. Work on most of the present housing began in 1916 when the land was acquired by the speculator, Charles Neville, who dreamed of developing everywhere between Rottingdean and Newhaven. The Ocean Hotel sits on a diamond shaped plot north of the Saltdean Lido. Both are fine examples of the seaside architecture of the period and both were designed by Richard Jones and constructed by the Saltdean Estate Company, which was formed by Neville in 1924. The hotel opened in 1938 but was soon requisitioned for the war effort by the Auxiliary Territory Service and later by the National Fire Service. In 1953, it was bought by Billy Butlin for £250,000 which he described as the “bargain of my life”. Butlin’s hotels were run along similar lines to his holiday camps, with theatres, cabarets, bars and restaurants. His literature described the hotel, which could accommodate 600 guests, as “A first class hotel with the added attraction of the popular Butlin ‘Redcoats’ and many of the entertainments and novelties of the famous Butlins holidays’. How could one resist? The symmetrical façade is, in my humble opinion, the building’s greatest feature even though the long-distance view was obscured in the 1950s when housing was built close by. The glass brick columns flanking the main entrance and mouldings on the ceiling of the foyer are also particularly impressive. 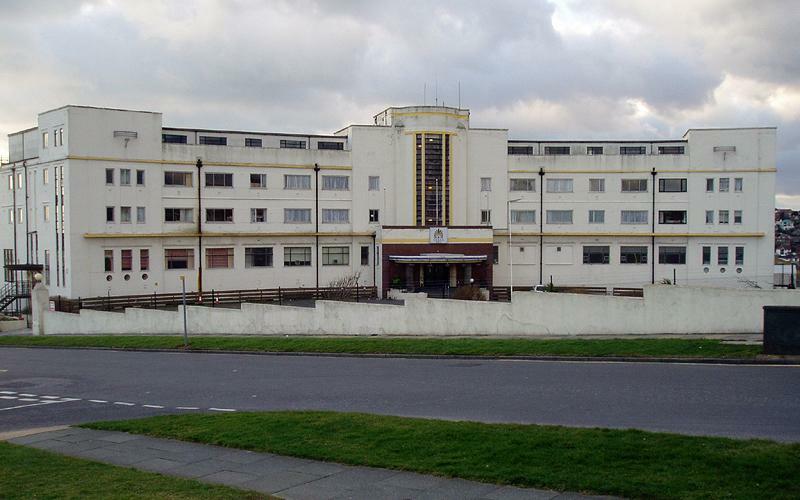 Rank Leisure, the owners of Butlins, sold the Butlins hotels to the Grand Hotel Group in 1998. The Ocean Hotel then became the ‘Grand’ Ocean Hotel by which time the capacity had risen to 750 guests. The hotel quickly closed and local residents were soon forced to fight plans to house asylum seekers there. The Grade II Listed building is to be restored and turned into 279 flats of which 102 will be ‘affordable’. The ugly blocks to the south of the main building which house guest rooms and the swimming pool, amongst other things, are to be demolished and replaced with new residential blocks. The exterior will be revamped and the ornamental gardens restored. Frankly, I can’t wait.